For many of us, sleep can be an elusive thing. Whether caused by insomnia, back or joint issues, sleep apnea or external factors in our sleeping arrangements, a lot of us struggle with getting a good night’s rest on a consistent basis. While circumstances and situations can vary wildly from person to person, quite often, simply sleeping on a more comfortable mattress can work miracles for the quality of the sleep that we get each night. Perhaps your mattress has simply worn out over time, or maybe what used to work for you no longer provides the comfort necessary to meet your needs. Whatever the case, buying a brand new mattress of high quality can put a substantial dent in anyone’s bank account. Once a novelty item, over the last decade or so, memory foam has gained tremendous popularity, and it is really no wonder why; with cushioned comfort, long-lasting durability and ease to clean and care for, it’s easy to see why so many are trading in the box springs for the cozy embrace of a memory foam bed. However, getting a brand new memory foam mattress can still cost you quite a bit, with prices ranging up into thousands of dollars, depending on size and design. Thankfully, now with memory foam toppers, shelling out a pretty penny does not have to be a concern. Instead of buying a brand new mattress, memory foam toppers are an economical and effective way to give your mattress that much needed upgrade without draining the bank account. The following ten memory foam mattresses are some of the best that we have been able to find out on the market, so you can start prioritizing getting a good night’s sleep, no matter what your budget might be. If you are looking for a twin sized topper, the Lucid Memory Foam Mattress Topper is a good option. Specializing in targeting five body zones, the Lucid’s design helps to alleviate common pressure points to keep sleepers from tossing and turning as they look for that ever-elusive comfortable position that will allow one to drift off into restful sleep. A unique feature of the Lucid includes the pleasant aroma of lavender to help accompany you into relaxation and sleep. The Lucid comes in multiple sizes, including the massive California King size. The Lucid is an incredibly comfortable option to upgrade your mattress with. The lavender scent is a feature that will either entice or repel you depending on your personal scent preferences and sensitivity. For some, lavender is a popular scent in aromatherapy that will promote relaxation and make sleep more accessible. For others, the scent can be overpowering and cloying. Whatever your preference, it is recommended that you let the Lucid mattress lay flat and air out for a bit before using it on your own mattress. If you have the option to open windows and let the room ventilate should the scent be overwhelming at first, this can help make the lavender much less cloying and faint. For most, the lavender smell will be something that you get used to over time, and will make bed-time a pleasant experience, enhanced by using all of your senses, but if you are not a fan of lavender or if you have a sensitive nose, the Lucid may not be your preferred choice. At a price range between $34.99 and $62.99, the Lucid is affordable and fairly priced, and with a 3 year warranty, it’s difficult to think of reasons why you wouldn’t want to give it a shot for a good night of sleep! Once again, we have a Lucid memory foam topper on the list. Instead of featuring the scent of lavender however, this model comes with infused bamboo charcoal in its design, which is a clever, hypoallergenic way to regulate temperature, odor and moisture. Like our other Lucid topper on the list, this topper also focuses on supporting five main pressure points of sleepers in order to eliminate tossing and turning. 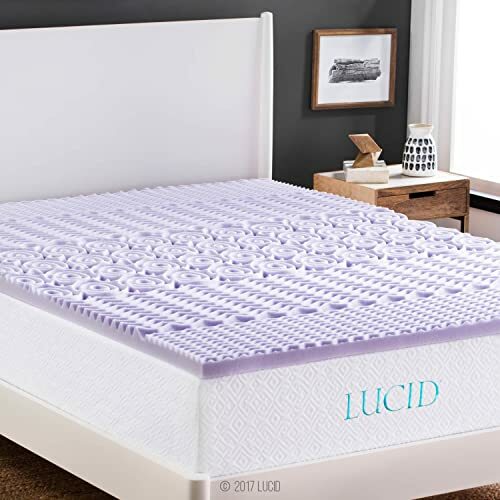 Lucid is a popular brand that sells memory foam mattresses and toppers, and like their many of other products, this topper delivers. Comfortable and good for those of us suffering from waking up sore after sleeping on traditional mattresses, adding this topper to your bed does an excellent job of giving the balance between stability and plush, providing cloud-soft comfort. The bamboo charcoal is a nice additional feature, keeping the topper clean and fresh, and is also hypoallergenic. It does tend to warm up the bed a bit more (many memory foam items retain heat like this), and for some sleepers who are sensitive to temperature, this can be an issue. For others, a little extra heat will add to the overall coziness of the sleep experience. As for thickness, for many, 3 inches of cushioning will be just about right. If the above memory foam option from Lucid runs a bit too warm for your tastes, then the Red Nomad queen size memory foam mattress is perhaps more your speed. In contrast, the Red Nomad is specifically made to keep cool air in and hot air out. It is a certified through CertiPUR-US®, which means that it is environmentally friendly and is made without ozone depletes, PBDE flame retardants, mercury, lead, and other heavy materials, and without phthalates regulated by the Consumer Product Safety Commission. Cleverly, the Red Nomad is designed about and inch shorter on all of its sides so you will be able to fit your sheets to your bed even with the added cushion it provides to your mattress. Certified quality produced in accordance with the CertiPUR-US® program. Cool Cycle Polymer design that keeps cool air in, and heat out. 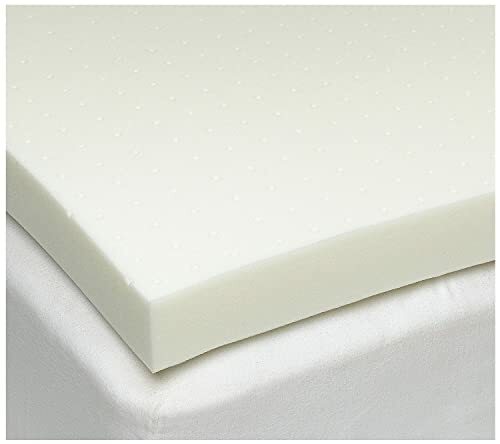 Topper is sized 1″ shorter on all sides to accommodate snug placement with fitted sheets. The Red Nomad may be a 2” thick topper, but the cushiony feel that it adds to a bed is an undeniable upgrade. 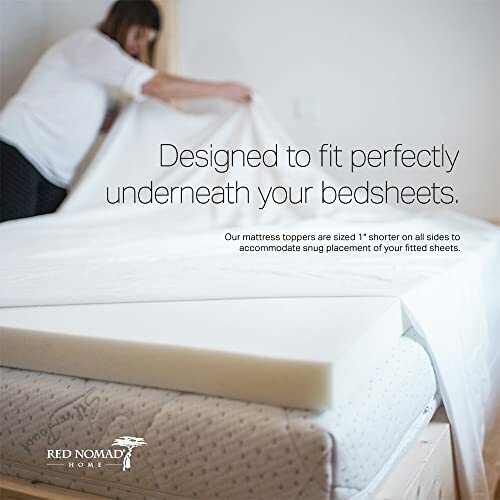 While other memory foam toppers tend to run a bit warm, the Red Nomad is designed specifically to keep cool, which helps eliminate nights of waking up overheated and sweaty. A very popular option on Amazon, the Red Nomad is cool, comfy, affordable and is designed to accommodate all sleepers, whether they be side, back or stomach sleepers. 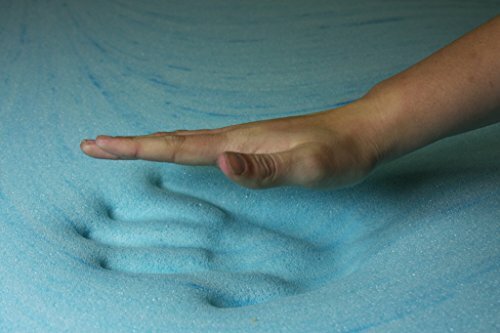 The DreamFoam Gel Swirl Memory Foam topper is as attractive as it is comfortable. 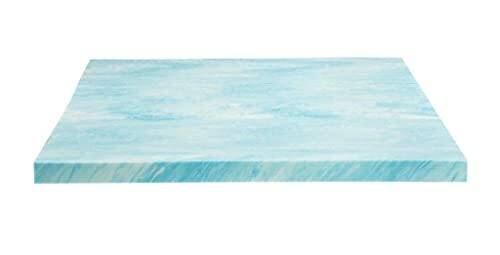 With a blue and white marbled design, the feeling of “sleeping on a cloud” is the perfect way to describe this mattress topper. Revitalizing any old mattress that is simply no longer providing the comfort that you deserve, DreamFoam is a welcome addition to the bedroom. This mattress topper is CertiPUR-US® certified, which means that it is safe for usage and environmentally friendly to boot. Whether you are interested in revitalize your aging mattress with the DreamFoam topper or you just want to give memory foam a chance to see if it is for you, this could be the topper that will win you over. With its marbled blue and white design, it gives off an aesthetic quality that some will appreciate, rather than the typical brownish or cream colored foam that these toppers come in. While the DreamFoam is a quality option, it is a bit more expensive, which is something to consider when you are shopping. Not every mattress needs several inches of memory foam to give a comfortable, much needed “oomph.” The Zinus is only 1.5 inches, but don’t let the thinness of it fool you–it still provides a substantial amount of comfort and support. The material is infused with green tea extract and castor oil to eliminate unwelcome odors. The Zinus may be thin, but it is a comfortable and supportive option when it comes to toppers. The green tea and castor oil extract does not leave a scent, but rather it does do what it advertises itself as being able to do– it eliminates unwanted odors and the bacteria that causes them. One thing to be aware of is that because the Zinus is so thin, it sometimes has trouble puffing up to its full size when it comes out of packaging. With a bit of patience though, the Zinus should reach its full size so you can start getting better sleep. The Zinus “runs cool” as opposed to other Memory Foam items, which have a tendency to retain heat more easily than traditional mattresses and toppers. The Milliard mattress topper is another popular option for sleepers who prefer to keep things cool at night. 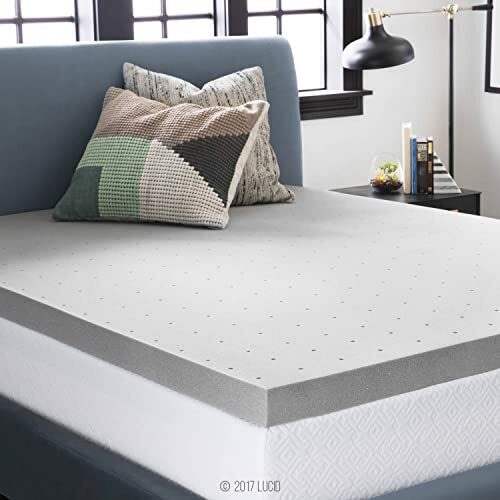 Designed with infused gel beads to help dissipate heat from your body instead of allowing it to collect in your mattress or mattress topper, the Milliard is the perfect response to the common issue that some memory foam customers take issue with: an overly warm mattress. This together with aerated ventilation tunnels provide help with the cooling effect as well. Comes in multiple sizes, and features an added bonus bamboo cover to keep your mattress topper cleaner for longer. The Milliard is soft and comfortable, but also provides a substantial amount of support to the back and joints. The cooling effect of the gel and ventilation design really does its job well, so if you happen to be someone who is sensitive to heat and you don’t find the way that memory foam tends to naturally retain heat to be particularly cozy, the Milliard is definitely for you. For asthma sufferers and people with allergy sensitivities, the Milliard is a good choice. 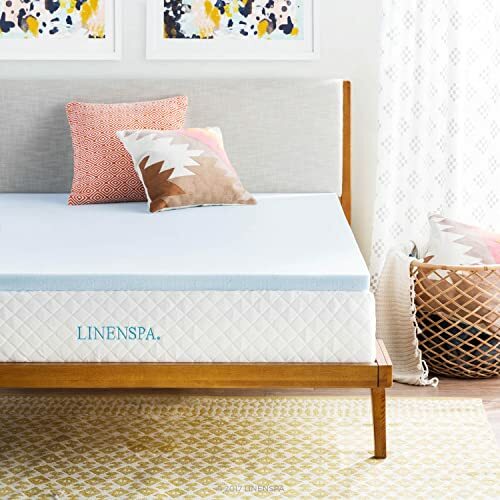 The Linenspa 2 Inch Gel Memory Foam Mattress Topper is a soft, supportive topper that will help you to relieve pressure points by distributing your weight evenly on the mattress, without sacrificing the soft, cushioned support that makes memory foam famous. Infused with gel that works to regulate body temperature by capturing and distributing heat evenly and comfortably, the Linenspa is another perfect choice for sleepers who run cool. The Linenspa is CertiPUR-US® certified for the quality standards that you deserve. Comes in a variety of sizes. A top of the line mattress topper, the Linenspa is another fine option for those needing to keep things cool at night. A snug fit to any mattress, no matter which size you choose to fit your needs, the Linenspa has the benefit of being a long-lasting, durable addition to your bed. Another option for cool sleepers is the SleepJoy. While not designed with the cooling gel that typically keeps some of our toppers from running hot, the SleepJoy still does the job with its ventilation feature. Comfortable, soft and supportive, the SleepJoy comes in 2 inch and 3 inch sizes, but the 3 inch option really creates the comforting, plushy boost that will enhance your mattress to make it feel like new. The SleepJoy is a thicker topper than most of the other ones on our list, but it is too comfortable to keep from mentioning. The extra inches this topper will add to your mattress should be taken into account when it comes to fitting your sheets to your new and improved bed. If your sheets don’t work with this topper, you can also purchase the 2 inch topper instead, or remedy the situation with deeper fitted sheets. This memory foam mattress topper helps keeps you cool at night, with its ability to reduce heat. Relieving aches and pains through specific pressure points is another selling point of this model. This topper comes with a PURGreen certification, which means it is safe and free from harmful chemicals. PURGreen uses independent laboratories to test products and ensure they are manufactured without use of prohibited content such as ozone-depleting CFCs, PBDE fire retardants, lead, mercury and other unsafe materials. Made using environmentally friendly processes. Exceeds PURGreen certification standards. 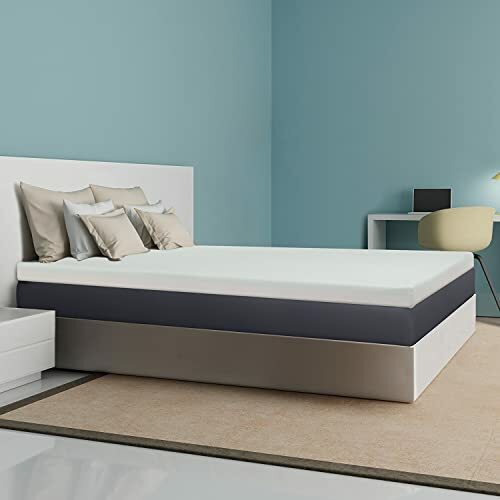 Now you can enjoy the benefits of gel inserts without having to buy a new mattress, simply by adding this Gel Swirl memory foam mattress topper to your existing spring, latex, or even memory foam mattress. While adding comfort and softness, The Gel Swirl is also specially formulated to contour to your body at any temperature, and will give you the extra support, without sacrificing that comfort. Memory foam provides a great sleeping surface, but what if you could add even more to your topper than just the plush cushion of memory foam, to add more support as well? Best Price Mattress designed a mattress topper with this in mind. Made with 1.5″ memory foam + 2.5″ high density foam, this topper gives a good amount of extra oomph to take your bed to the next level. Comes with polyester Mesh cover zippered. In normal temperatures, this mattress topper is somewhat firm, but when you lay down on it, it begins to react to the temperature of your body and then mold itself to your shape. As your weight is evenly distributed along the surface, it helps to relieve pressure points, which provides you with the opportunity to sleep more easily without tossing and turning. Who could ask for anything more than that? For many, many people, memory foam is the answer to their sleep woes. Since any mattress can be re-vamped into a memory foam mattress with toppers, the issue of cost and limited budgets can be eliminated from the equation altogether. Since quality sleep arrangements can be a challenge for many people due to a whole variety of reasons, it is nearly impossible to find the one, perfect mattress or mattress topper that is going to work for every single person. Here are some things to consider before making a purchase. Does memory foam work well for people with back and joint issues? The answer to this question is, for many, many people, yes! 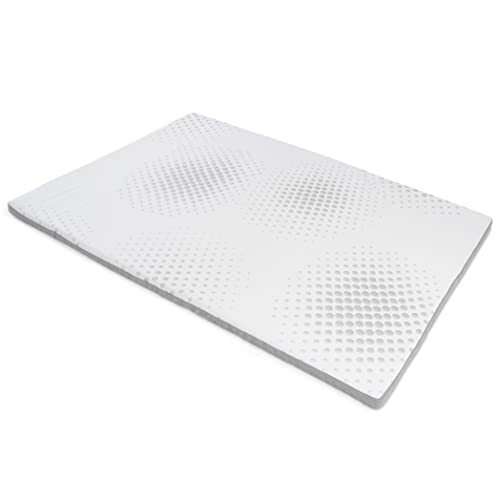 As you can see from the items listed above, many of the memory foam toppers are designed to cater to particular pressure points in the body that are most commonly the areas that cause discomfort and pain when you are trying to sleep. Unlike traditional beds with springs, memory foam caters to the particular contours of your body, holding you comfortably through the night as you sleep. Not all memory foam mattresses and toppers are of the same softness and density, so there is some variability and customizable options to cater to whatever your particular preferences and needs might be. Memory foam has a history of being used in medical settings long before it came into use for the general public, in particular for patients who were bedridden and suffered from bed sores when subjected to traditional mattresses. Today, many people still find the medical advantages of memory foam to be just the thing that they are looking for to help them with aches and pains. That being said, it is always wise to check with your doctor if you are concerned about whether memory foam may be right for you. Does the buoyancy of memory foam last? Memory foam is designed to keep its shape, texture, and cushioney bounce that it is so renowned for. The springs of a traditional mattress to have the tendency to wear out over time, which is one of the reasons that so many more people are turning to memory foam instead. While many products on the market may be referred to as memory foam, the basic design and quality of the product has, over the years been co-opted into other brands. 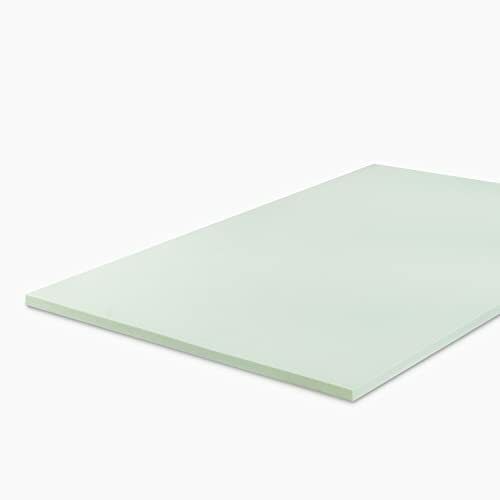 While quality may vary from brand to brand, memory foam is essentially a low low-resilience polyurethane foam that gives it the signature softness and cushioned feeling that keeps shape when impressed upon. When picking a mattress topper, make sure you purchase one with a decent warranty to make sure that you will be able to settle with a purchase that will best serve your needs. Is the hype around the comfort of memory foam true? Memory foam has gained popularity over the last decade on the mattress market and it is showing no sign that it will slow down anytime soon. Memory foam has found its way into the realm of mattresses, toppers, pillows, pads and the soles of shoes to name a few of its uses. With such high demand for memory foam to make our lives more comfortable, the general consensus is that yes, memory foam’s legendary comfort does live up to the hype! Being deprived of the ability to get quality sleep is tremendously frustrating. Nobody should have to sacrifice comfort because they don’t have access to a comfortable mattress. Considering how expensive mattresses can be, it is all too often a situation that we find ourselves in. Mattress toppers can give an old mattress a new feel without you having to shell out the extra cash, making real comfort and quality sleep something so much more accessible to a wider base of consumers. At affordable prices and with designs that have improved over years of refinement, thanks to customer design, a memory foam mattress topper is a great purchase. You have very little to lose and everything to gain!